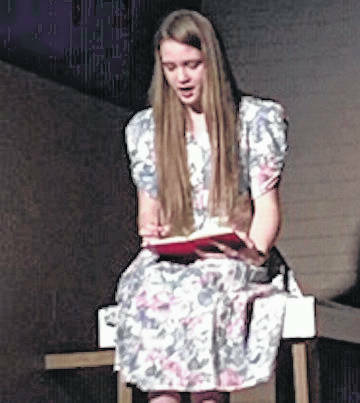 Opening night for The Diary of Anne Frank will be Friday April 12 at 7 p.m. Saturday and Sunday shows are 7 p.m. and 2:30 p.m., respectively. Tickets are $10 and can be purchased online at MorrowLittleTheater.org or can be purchased at the door. The Capital Theater has allowed MLT to do the production of this historical play at their location in downtown Mount Gilead. It taks you back to the era of the greatest generation as you follow the young soul of a Jewish girl in hiding for her life. You will discover what it is like living with several other people in a cramped upper room (attic), and constantly be worried for your life. There is a lot of local talent in this production and a great deal of work has been done to bring this play from page to stage. Pictured during rehearsal is Emma Scott as (older) Anne Frank.